Welcome to Life Coach College, where Coaching is more than theory, it's a way of life. Offering 60 hours of coach specific training for only $895. Life Coaching is a natural or organic method of helping people deal with changes and challenges in everyday life. Life Coaching helps expand your possibilities and allows you to quickly and easily understand the underlying dynamic in most conflicts and problems. 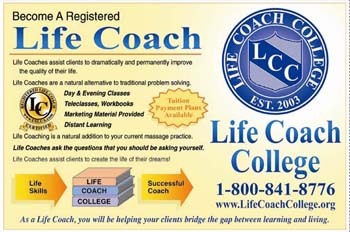 We are now accepting applications for the new Life Coach program starting December 5th, 2011. Curriculum includes, live and recorded classes, on-line study, practice coaching sessions and one-on-one mentoring sessions with a mentor coach. This seems to be the hot topic in Coaching today, do you need to be certified. At Life Coach College, we have taken the position that certification can show your commitment to the coaching profession. It shows you are a professional, but certification alone will not make you a successful coach. In affiliation with the US Life Coach Association, we are offering certification to those who complete the Life Coach College course of study. Life Coach College offers 60 hours of coach training that is specifically marketed as teaching coaching skills and behaviors, teaches students how to apply technical skills in a coach-like manner, and transfers those skills in accordance with most coaching organizations, including the ICF and the IAC. Coaching is now on the radio, with Life Coach Radio. Join media personality Jeff Wasserman to learn more about Life Coaching, the Life Coach Bus, the 2011-2012 Road Trip and how you can become a Life Coach Ambassador. Life Coaching is fast becoming a household word. You hear it mentioned on television and radio, you read about it in the paper, magazines and books. Currently less than 3% of the population utilize the services of a Life Coach. Have you ever wondered why some Life Coaches are successful and others are not? Coach training is only part of the skill set required to be a successful coach. Life Coaching is a skill set. Life Coaching allows you to quickly see the dynamics at play and make much better decisions in life, that will allow you to move closer to your goals. Life Coach College offers programs and classes for those wishing to learn these skills, but do not wish to pursue a career in Life Coaching. 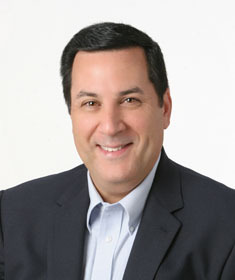 Jeff Wasserman, the Founder and President of Life Coach College believes in the power of the media. Jeff is currently on the 2011-2012 Life Coach Bus tour. The Road Trip will be dedicated to promoting Life Coaching. If you would like to affiliate yourself with the Bus tour, please visit Life Coach Media to learn more. 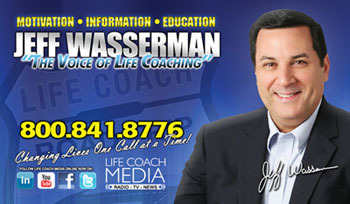 My name is Jeff Wasserman and I am the founder and president of Life Coach College. I have been in the self-help, personal growth and Life Coaching field for most of my life. I am also a licensed Massage Therapist, Reflexologist and Advanced Myoskeletal Therapist. After receiving requests from hundreds of Life Coaches in the US asking for help in building their Life Coach practice, I saw the need for a coach training program that teaches more than coaching theory. Most of the coaches who contacted me wanted to know my strategy or secret. There is no secret, you just have to live coaching, not just learn the theory. I started Life Coach College with the philosophy that we live coaching, we don't just teach coaching theory. The first class was held in February 2003. Q) What educational background is required to attend Life Coach College? A) The only requirement is a minimum of 18 years of age, although most successful coaches are 30-60+ years of age. No prior college experience is required. Q) How long does it take to become a Registered or Certified Life Coach? A) It takes 16 weeks to become a Life Coach, although most coaches report a 6 to 18 month period to build a practice. Q) What is the cost of the program? A) The cost is $895 for the program. Certification is additional. Q) Which organization certifies the students of Life Coach College? A) Certification is available to all students by the US Life Coach Association. Students may also apply to the ICF and the IAC for membership and certification after attending Life Coach College. Q) What is the difference between a Registered Life Coach and a Certified Life Coach? A) Upon completion of the required coaching program, you will receive a diploma from Life Coach College as a Life Coach. If you are a Life Coach, you may request to be Registered with the USLCA at any time, by fulfilling the additional requirements and paying the one time fee of $100. Or upon completion of the course,you can apply for certification by the USLCA. Upon completion of the process, you will be awarded a Certified Life Coach designation. There is an additional fee charged by the US Life Coach Association. Q) When are the classes available? A) The new 60 hour coaching program starts on December 5th, 2011. With the new floating start dates, you may start at any time in 2012. Q) What is the difference between coaching and therapy? A) Coaching works with clients who would like to improve their life, while focusing on the future. This is usually accomplished by designing a life plan, setting goals and redesigning the way you react to life's challenges. Therapy generally focuses on a specific issue in ones life, looking at the past to discover why the client feels the way they do. Q) How does distant learning work? A) Students receive a total of 5 workbooks, coaching cards, personal growth programs & marketing material. All classes are recorded and allow you to listen on a pre-recorded basis. 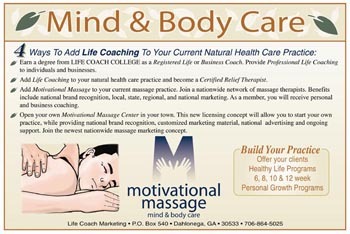 Life Coach College is offering a new program designed for natural health care professionals. You can add Coaching to your current practice. Life Coach College will provide you with the skills and methods to assist your clients to improve their lives. Join Life Coach College and become part of the nationwide Life Coach Bus Road Trip. 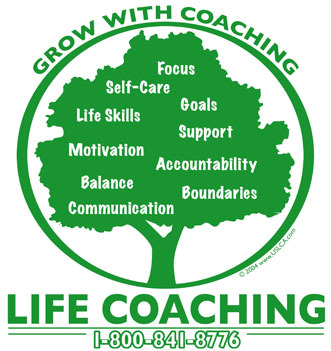 The Life Coach Bus will be traveling coast to coast in 2011 and 2012 promoting Life Coaching. If you wish to become part of a movement, meeting people and helping to make this world a better place to live, then Life Coach College is the right choice for your professional coach training. Life Coaching is a natural form of personal growth. Some clients describe their life coach as a friend, teacher, cheerleader, support group, travel agent for life, tour guide, even as a healer. Some like to compare hiring a life coach, to having the private phone number to the author of your favorite self-help book. Life Coaching is the fastest growing form of personal growth. Currently their are over 30,000 coaches worldwide and over 10,000 currently practicing in the USA. Compare this to other professions, for example their are over 72,000 practicing attorneys in the state of Florida. Their is over 100,000 real estate professionals in the state of Florida, yet, their are only 10,000 Life Coaches across America. Many mental health professionals predict that hiring a Life Coach to help you organize your life plans and assist you in leading the most productive and healthy life will be as common as hiring a real estate professional to buy or sell a home. Many coaching leaders predict there will be over 100,000 practicing life coaches in the US by 2020. If you plan to enter the field of coaching, now is the time. Life Coaching is unique and effective. Coaching is not therapy. As a Life Coach we do not analyze, diagnose, label or treat. As a Life Coach we assist our clients to create the life of their dreams, by designing a life plan, often called an action plan. Coaching is a forward thinking concept, we do not dwell on the past. Instead we focus on the here-and-now and the future. Why spend time focusing on the past, the only thing that you can change is your view or perception of the past. Coaching is all about focusing on your thought process, not the events. We often say in coaching, it is not about the story, it is about how you react to the story. Why Choose Life Coach College vs the other schools? As I am sure you have found by surfing the web, there are over 100 coaching schools. They all have something to offer and each one is unique. Unlike some science based trades, where all the training programs use very similar training methods material, Life Coach training is very much a reflection of the founders and trainers associated with the school. We teach from our own experiences and knowledge. I personally know many of the founders and owners of the different training organizations and there are many good schools to choose from. But Life Coach College is different, it is unique in the fact that I am putting together a movement, which is the foundation of my coaching model. Most coaching schools teach you the necessary coaching models and methods and then send you out in the real world to try and build up a practice. Let me tell you first hand, that is the most difficult and challenging part of coaching. Coaching is fun, coaching is rewarding and very gratifying, but trying to find your first paying client is frustrating. That is why you need more than a school that teaches you the basics and then sends you out to find your way. At Life Coach College, I am building up a grass roots movement, similar to starting up a new political party. I have devoted a great deal of my time to planning the 2011-2012 bus tour. This idea was tried on a very small scale in 2000 by Thomas Leonard and was very successful. Thomas passed away in 2003 and I am taking that idea one step further. If all your looking for is an education and a diploma, than you have many great choices in coaching schools and I will be more than happy to give you some recommendations to other schools, but if you are looking for a "family" to be part of, a group, an organization, you have come to the right place. From the new Life Coach Bus, the Radio show, TV show and Life Coach News, billboards, flyers, magazines, you name it, I am going to dedicate my time and energy to promoting the Life Coach profession and help my students find paying clients. If you wish to discuss this with me or have questions that I can answer, please call me at 800-841-8776.